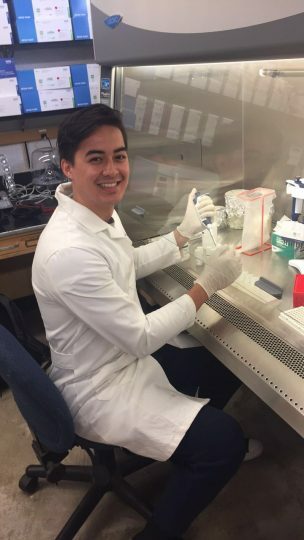 Mitch Rezzonico, who recently obtained his baccalaureate from the University of Oregon in 2017, has been learning bioinformatics with Dr. Sue Ishaq in the BioBE lab since last summer, in order to gain hands-on experience in preparation for a career in bioinformatics and medical research. He is one step closer to that goal, as Mitch was just accepted into the University of Oregon’s Bioinformatics and Genomics Master’s Program! The program is a combination of in silico academics and training internships offered through a variety of local institutions. Mitch graduated with departmental honors for his Biology degree, as well as completed a minor in Chemistry. After completing his master’s, Mitch plans to pursue a medical degree, and eventually combine the two into a research position. His long-term career goals involve applying bioinformatics to public health issues, such as antibiotic resistance or personalized medicine.